The announcement of vSphere 6 and it’s sometime in quarter 1 release date ultimately means that the certification treadmill begins anew. I figured it was a good time to scrounge around the certification portal and see what’s in store for VMware exams and certifications. Once again, it seems that we’ll be going through a round of hybrid exams that are version specific but have an expiration date with recertification requirements. So much sad panda. I also noticed that the cert is expressed as both VCA-DCV and VCA6-DCV; let’s just assume they mean vSphere 6 somewhere in there. From a course perspective, there’s the typical What’s New course, followed by ICM and Optimize and Scale. I do see the ability to use on-demand services for all of the courses, which is a handy option for busy professionals who can’t evacuate the premises for 2-5 days straight. No clue what that is, yet. This is where it gets a bit different. 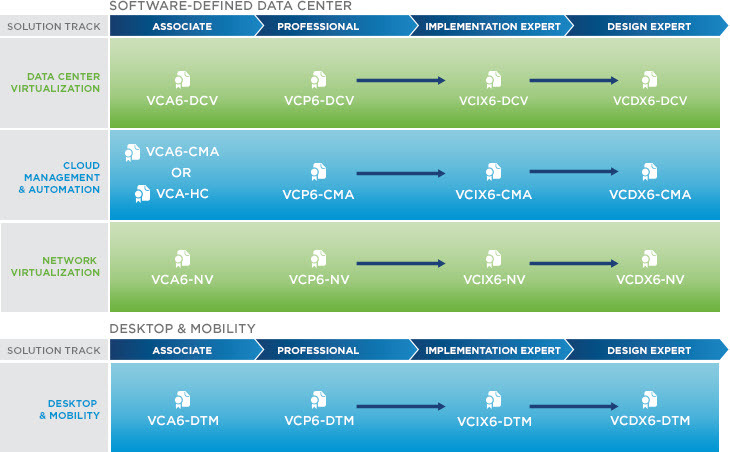 The VMware Certified Advanced Professional (VCAP) is no more, but we already kinda knew that. Prior to there being VCAP certifications, there were still the two exams (Admin and Design) that resulted in zero certifications; they were simply the requirements for VCDX. The VCAP certifications were born and bestowed separate certifications – being the VCAP-DCA and VCAP-DCD – and also remained as VCDX requirements. Current VCDXs could upgrade their VCDX version by passing the latest VCAP-DCD. I sort of chuckle at the Elite status thing. For those looking for a relevant course, the suggestion is vSphere: Design & Deploy. It appears the only change here is how you fulfill the requirements. With the VCAP-DCA and VCAP-DCD being folded into the VCIX-DCV, earning a VCDX appears to have the same number of exam requirements. I’m curious how upgrades will be handled – do VCDXs have to take the full VCIX to upgrade, or will the Design exam be enough? The certification site is a real mess with no real consistency across versions, certification names, exam numbers, or a pure “this is exactly what you must do” sort of workflow. I’m very disappointed in the quality of the site and how difficult it is to get real answers from it. 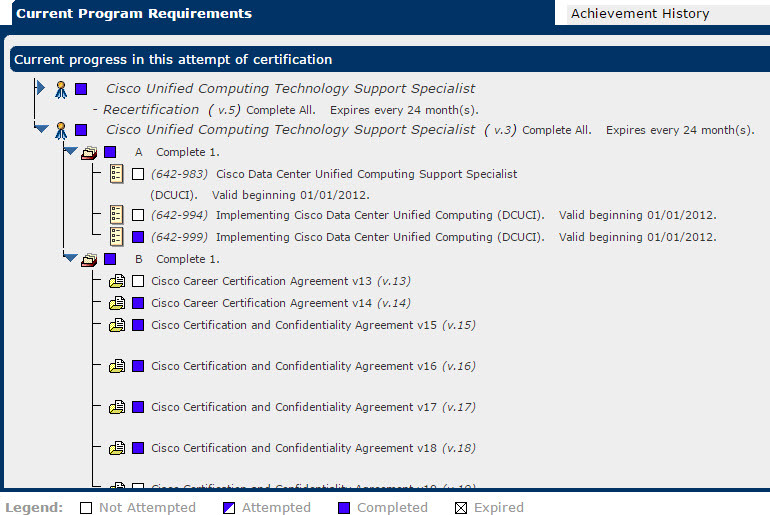 Just look at the certification sidebar: it has a wild collection of certification names and links that are confusing. Stop with the static web pages and whack-a-mole information silos. Give me one place where I can map out everything necessary to certify or recertify. The workflow tool should also update with my actual progress and not just be an example web page. Here’s an example from Cisco, which is the gold standard in certification handling in my book. Requirements are a big deal, such as the VCP-NV not counting for VCP-DCV or VCAP-DCV unless a course was taken. Information like that should not be hidden behind an asterisk. I would expect a 5 piece band blaring trumpets in my face shouting that sort of thing. Especially when it looks like the change was reverted – why are there no details on this? It also goes back to my previous suggestion: if you had a robust workflow tool for certifications, I would see the requirement as part of the workflow. Perhaps I’m just overly tuned to variations in the certification program, but it seems like the workflows to achieve certifications and meet requirements are changing too rapidly. Come together as a team, pick a standard, and run with it. Stick with that standard through an entire major release cycle and don’t make adjustments unless they are dire (and in that case, explain the change, why it was made, and be transparent about it). Certifications are a big deal that professionals spend hours working towards, typically on their own time. It takes us away from our families and friends. Partners and manufacturers are required to take exams in order to succeed in the ecosystem. If you continually treat the rules like they are malleable, it takes away from the ultimate value of the program. It’s ironic really as I believe Eric Ullanderson is still in charge of VMware’s global technical education program, and he was previously in charge of the certification program at Cisco, so he knows what should be offered. Personally I’m at the point of letting mine lapse as I can’t keep up with the pace of change but that’s probably just me and old age! I’m glad you are unhappy with the current state of things as well. What exactly does that mean, or has VMware not announced it yet? @Joshua – Good question. I’ve updated the post with clarity. The short answer is: no clue, that’s all that was published. I agree will what you have said. I really hope VMW will make the Cert process much easier and less complicated…SOON! Erik left about a year ago. Chris, your last paragraph sums up my feelings entirely. This is very disappointing. VMware is turning their certifications into Microsoft’s giant ball of confusion. Likewise I too have been studying for my VCAP550-DCA and was prepping for a 2nd attempt. Now i’m left wondering if I should just wait and sit the VCIX :-/ arrgghh…. 1. How will VCAPs be “upgraded” to VCIX? 2. It looks like the exams are being made easier (two hours isn’t necessarily easier that four, but given how much was in the VCAPs, they were pretty tough for the whole four hours).This devalues the cert, so its hardly an upgrade. I share the frustrations in most of the sentiments in these comments, but if I’ve learned one thing from VMware/EMC is that they don’t care and won’t listen. If you have one current VCAP you ought to wait for VCIX, then one exam = latest cert and you’ll have your existing VCAP. No VCAP? If you only want one exam then take a VCAP. Then one exam 1 cert. If you wait for VCIX you’ll need 2 exams for 1 cert. Unless you just started studying, continue with the DCA. That way you get a cert. The next question is, do you want to maintain a cert at that level, as you’ll need to also pass VCIX-DCV design to get VCIX-DCV (one Admin + one Design = VCIX). This language has been pulled from the roadmap. I can’t find this information anywhere, so it would then answer the question – many thanks. In an email from VMware Certification Operations. I would expect a FAQ out shortly. Many thanks for confirming that – it is much appreciated – as I was worried the existing certs. wouldn’t be recognised. Are you able to forward it on? To the person who keeps posting derogatorry comments towards VMware and Chris: Please stop, you are the one who is hiding behind a pseudonym and acting in an unprofessional manner. While we are all a little annoyed with the possible changes to certification it is nothing new. This is common across all vendor certifications and usually in response to a change in the technology or market. How about we sit tight and see what comes out of it all. Once again, thank you Chris for your help to the community and keeping us all updated. @Ben – no worries, and thank you for the support. I don’t mind comments of just about any sort, but comments with profanity and “I hate X” sites serve no purpose on this blog and will be expunged. What a bunch of uncaring money grabbing scammers !! The exams are so far-removed from the certs and whats more is that vmware don’t care one bit about the money and time people spend on certifying .. Especially people who have compled have the VCAP requirement and not only that ,having to make people do and exam to stop their hard earned certs expiring and then still forcing them to take the vcp 6 exam ..seriously WTF ? The whole education team are a bunch of wops !